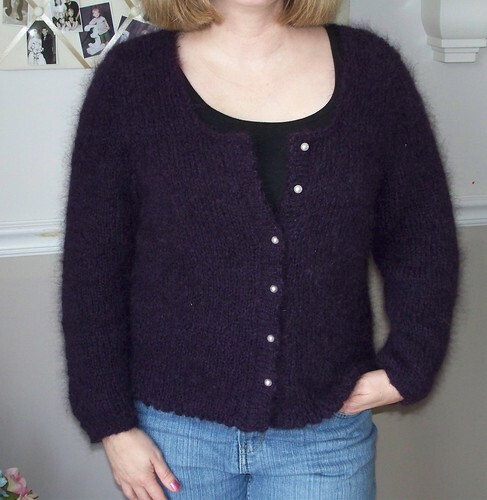 Here’s my second FO of 2010 – a very fuzzy sweater! Modifications: I made several modifications to this. 1. I substituted the Suri Dream for the mohair blend yarn called for in the pattern. I am allegic to mohair, but I really liked the fuzzy look of this sweater. So far, the alpaca is not making me itch – which is good! 2. If you’ve seen the original pattern, then you know that this is supposed to be a puffy short sleeved sweater with ruffles on the neckline and the sleeve cuff. Well, I knit the first sleeve per the pattern and then decided that the puffy short sleeves (which hit me at the elbow!) were not very flattering for me. I ripped the sleeve out (quite a chore with the fuzzy alpaca yarn!) and re-styled the sleeves to be long sleeves, and not poufy. I simply eliminated the increases at the start of the sleeve, and did gradual decreases throughout the length to taper the sleeve. 3. I also worked a picot fold-over hem at the bottom hem instead of the plain stockinette – I wanted to eliminate the roll that you get with plain stockinette, and the picot hem looks very nice with the pattern’s picot buttonhole band. 4. I eliminated the ruffles. I was going to add them, but once it was done I decided that I really liked how it looked without them. Overall, I am very pleased with this! It’s a bit on the dressy side – so I don’t suppose I’ll wear it very often, but it is nice and soft and warm. Which, right now with all the cold weather we’re having, is quite welcome! Oooh what a beautiful, cozy looking sweater! Great mods!